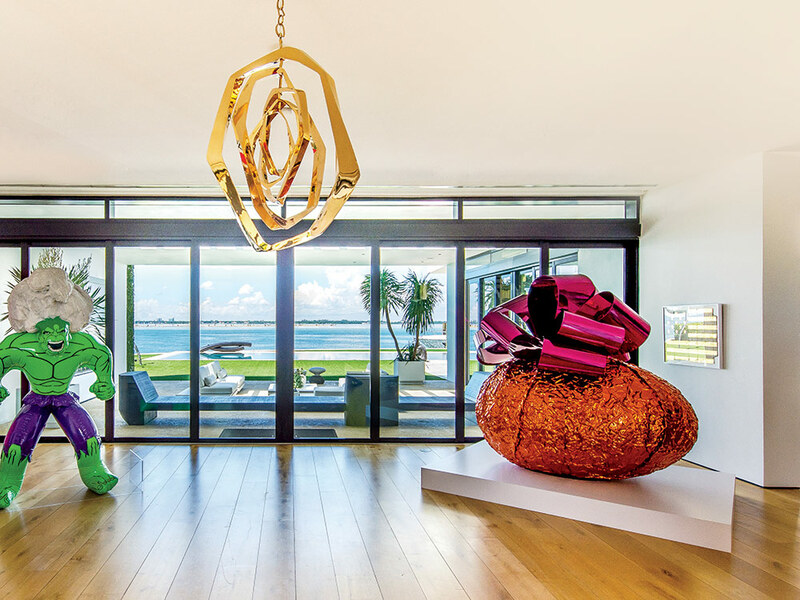 Businessman and philanthropist Stephen Levin and his wife, Petra, epitomize artful living in their luxurious bayfront home on Miami Beach. Petra Levin in front of Fluctuations in Space-time by Takashi Murakami and flanked by Baroque Egg with Bow by Jeff Koons. Behind her are Ai Weiwei’s Bowl of Pearls and Pinocchio and Penny-Farthing by Urs Fischer. 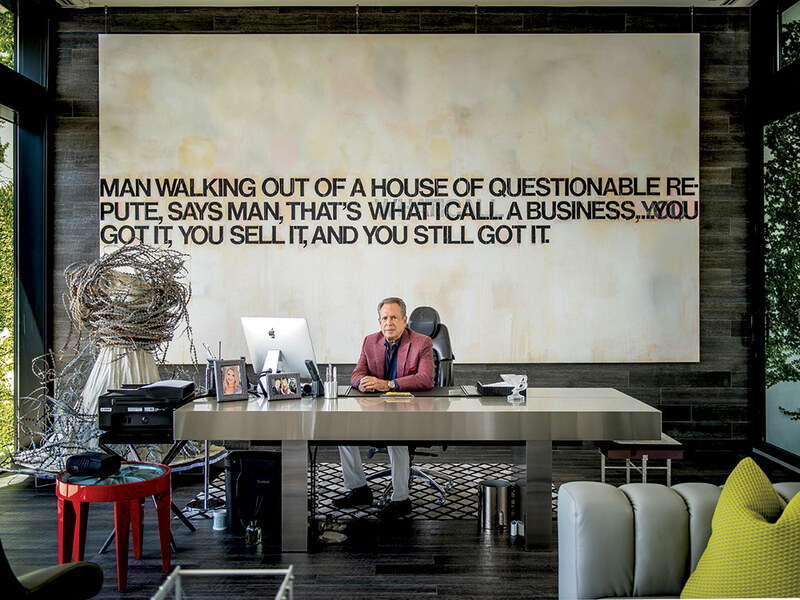 When beverage tycoon Stephen Levin and his German wife, Petra, planned a move to Miami Beach a couple of years ago to be closer to Levin’s business headquarters, they knew they wanted a very particular kind of house. In possession of one of the most significant collections of art in Florida, the couple needed a dwelling that would not only suit the way they live, but also aptly accommodate the quality and volume of their collection of paintings and sculptures—which includes pieces by Pop masters like Andy Warhol, Roy Lichtenstein, and Claes Oldenburg; works by graffiti artists and heavyweights of the ’80s such as Keith Haring, Jean-Michel Basquiat, and Anselm Kiefer; and sculptures by contemporary icons like Jeff Koons, Ai Weiwei, Anish Kapoor, and Frank Stella. 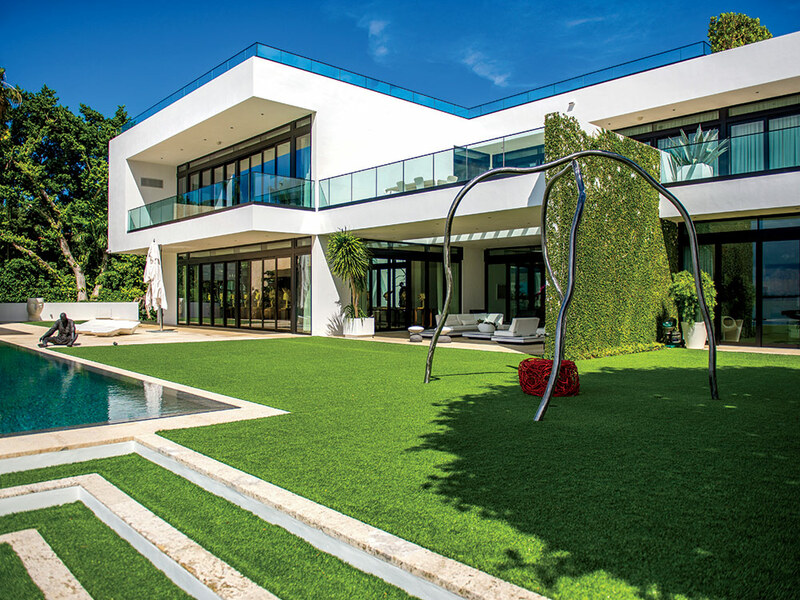 They found what they were looking for in Yankee slugger Alex Rodriguez’s 22,000-square-foot Ralph Choeff–designed manse overlooking Biscayne Bay on North Bay Road and offered him $30 million—the highest price paid for a house on the Beach at the time. The property was a perfect fit for a man who sold Gold Coast Beverage Distributors reportedly for over $1 billion. Inside the estate, everything is perfectly manicured, and nothing is left to chance—the shades close automatically to prevent the sun’s tropical rays from damaging works by Banksy and Damien Hirst that are just steps from the window. Months later, the Levins have settled in with their four dogs—Tui, Tasha, Charlie, and Chicco—and Ocean Drive got an exclusive inside look at their extraordinary art collection and stunning interiors, which Petra pulled together in short order. Read on for what the generous and gracious couple had to say about their art, their lifestyle, and the charities they support both locally and around the country. Injecting a note of drama into the extensive lawn near the pool is a stainless-steel sculpture by Forrest Myers, Gazebo with Tuffit, while a bronze sculpture by Hanneke Beaumont sits near the pool’s edge in the background. What appealed to you most about this house before you bought it? Stephen Levin: We saw pictures of this home when it was for sale, and a friend said he could arrange for us to see it. We saw it through [our real estate agent] but we could not reach terms, and it was taken off the market. When it was off the market, Petra and I came to terms with Alex [Rodriguez] and purchased the home. Petra Levin: It was several things: the modern design, the size of the home, the footage on the bay, and the gorgeous view—having almost 300 feet on the bay was very appealing—and also the view of downtown Miami. SL: We have a 70-foot Ferretti boat. The architect, Ralph Choeff, is so talented. I like that there’s a strong indoor-outdoor connection with his work, and also that it’s modern, but warm. SL: There’s a very open quality. It’s an open house, yet it preserves our ability to display our art collection. We didn’t meet [Choeff] when we bought the home; we met him later. When we purchased it, we did make some changes. Was it challenging making decisions for the interiors? SL: Basically, Petra said she wanted something, and I said yes or no—it worked very well that way. Our tastes are the same; we love contemporary things. With a modern home, it was easy when you both have the same contemporary tastes, and our art collection is modern and contemporary. SL: My den. I like the light and looking out at the water. The lime green sofas in that room are great. PL: They are the only chairs that are colorful. In general, I wanted the interiors to be neutral to let the art shine. But because [Stephen’s den] is the man cave, I wanted to have a little bit of color there. A painting by George Condo (left wall) is among a series of works lining the hallway. Did you bring anything here from your Palm Beach house, or did you start fresh? SL: We started fresh. A lot of the furniture came from New York. We bought a number of pieces from Hudson Furniture. PL: And we finished in a record time—five months. What did you preserve in the home? SL: The vast majority of the home was preserved. We did change the entrance, we changed the front courtyard, we removed the batting cage. But I kept Alex Rodriguez’s urinal in my bathroom. PL: You and Alex have something in common. He built a beautiful home, and that’s why we fell in love with it. What did you do with Alex’s built-in batting cage? PL: We took the door out and redesigned the whole room into three different areas. We brought the gym that was [in the freestanding structure on the back lawn] upstairs, and we created a little gallery. Past it is the managing office for the people who work here. [Originally] there was no storage, and so one side is now all storage. We left the original lights from the batting cage, though. 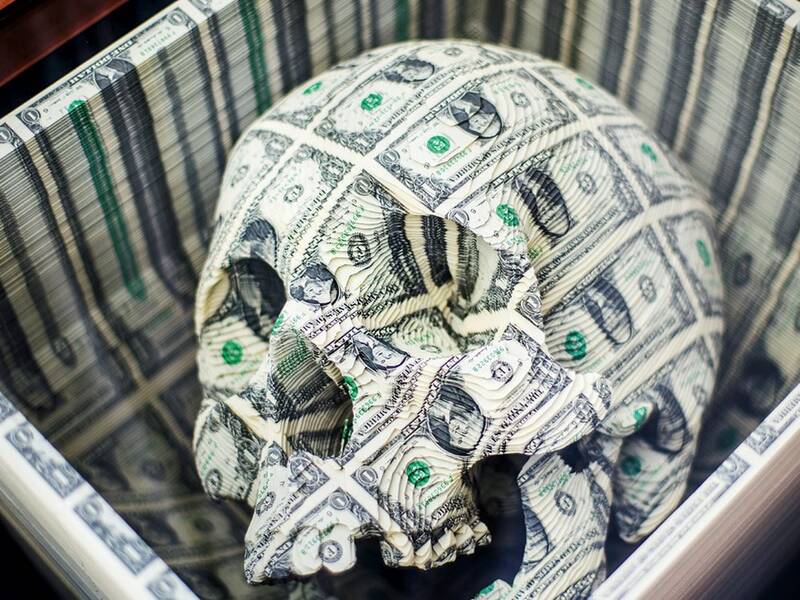 A Skull Box by Scott Campbell in the den. How many pieces of art do you own? SL: About 20 years ago. I sold my first company and had money. When you’re building companies—and I’m an entrepreneur, I’ve developed a number of companies—you tend to make the bulk of your money when you sell it. But I’m still an active businessman. Do you buy most of your art from dealers or auctions, or do you go to fairs? SL: We originally bought it at fairs and from dealers, and now we have a private art consulting firm that represents us. We use a professional advisor and negotiator to advise us on our purchases. Do you regularly go to Art Basel in Miami Beach? PL: We go every year. SL: We go to the one in Switzerland, too. PL: And we go to Frieze in London. SL: Good art is getting harder and harder to find with so many collectors and museums. You have pieces by Jeff Koons, Ai Weiwei, Urs Fischer, Keith Haring…. SL: We also have works by Banksy, Damien Hirst, George Condo, [Andy] Warhol, and Jacques Lipchitz. We display all our art; we do not keep it in storage, so therefore we constantly have pieces at auction as we require new space in the home. We always have, at any given time, three, four, five pieces at auction. [We also have] a Miró sculpture—it’s called Conch Shell—but actually it’s very Freudian if you look. In the office created in the freestanding structure that had been Alex Rodriguez’s gym, Stephen Levin sits at a stainless-steel table/ desk by Gabriella Crespi in front of a Richard Prince painting, When I Called, and next to a sculpture by Anselm Kiefer; reflected in the pool, a sculpture by Byung Hoon Choi, After Image of Beginning, offers double the impact against the bay and the Miami skyline in the distance. Being surrounded by art is almost like being surrounded by a bunch of interesting friends that make things engaging. PL: Some people say, “Oh, you should have a gallery,” but we like to live with our art. This house is great for your art collection, but how does it suit your lifestyle in other ways? SL: We don’t have big parties. We have another home in Stowe, Vermont, but this is our primary home, and here we’re really more private. Now that our kids are grown, we watch over our dogs, although we’ve been active in charities in Palm Beach, and we’re active in charities here. Which charities are you involved with? SL: The University of Miami, Mount Sinai Hospital, and ICA—those are the local charities. There are others, too. We’re active with the Caron Foundation, the University of Pennsylvania, and MorseLife in West Palm. Now that you’re here, what do you like best about living in Miami? SL: What it offers—the sports, the restaurants, and the vitality of the city. It’s dynamic. PL: Everything has changed. It’s very international—the art—there’s so much more going on in Miami. SL: We’ve made wonderful friends, and we enjoy it here. [It’s] just a whole new world for us coming from Palm Beach, which is a wonderful place, but a very small-town environment. I come from a small town—Reading, Pennsylvania—and Miami Beach has a small-town quality, too. So it’s a great city for us to live in.